A strange take on the Bourne movies where the action here feels even more real and artistic, but the story itself is pretty routine. Haywire isn’t the kind of movie that is especially great the first time you see it. that’s because there is so much that went into this movie, so much art and creativity, that a lot of it can be distracting on a first viewing. there are also a lot of characters and names. The movie is definitely an updated version of the Jason Bourne films, complete with it’s storyline about a spy getting sold out and targeted by her former organization. Only it has a little something extra that those matt Damon movies didn’t. What haywire has that’s unique is a lead actress, Gina Carano, who is not really an actress at all, but a mixed martial artist. She’s someone who not only does her own stunts, but also does stunts in ways that no other actor ever could. It seems like this movie was based around having Carano in the lead, and then throwing a bunch of talented name actors all around her. In the hands of director Steven Soderbergh, it works. Soderbergh is the guy who makes movies that feel like art. he is always experimenting, whether it’s making film that feel like indies, such as Full Frontal, and The Limey, or movies that actually are indies, like Bubble. he has also made much bigger main stream movies like Traffic, Out Of Sight, and Ocean’s eleven. Soderbergh always wants to be stretching himself, trying something different. He made the good German with George Clooney in black and white, and with the feel of a 1950s movie. 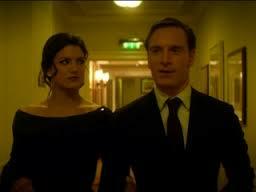 with haywire, Soderbergh is out to make a spy movie that feels like a seventies film. It’s got that Blaxpoitation kind of music (bow chica wow chica wow wow), and lots of quiet moments where all we can here is the sound of characters moving. there have been a couple of movies like this, that went for that seventies vibe, over the last few years. Most of them star George Clooney. There was Michael Clayton and then the American. While Clooney is great friends with Soderbergh, it seems that he has made this kind of movie too often now, and so he sidestepped being in haywire. He is hardly missed, considering that the film features Michael Douglas and Antonio Banderas in the older government roles, and then Ewan McGregor, Channing Tatum, and Michael Fassbender in the younger, spies in the field, roles. these are all great actors, and it really helps the movie out that they are recognizable names and faces. there are just so many characters here and things to keep track of, that every little bit helps. and having actors that we are familiar with means that we don’t have to remember everyone’s name to follow the plot. aside from having the familiar faces, the movie does something else very smart to help us follow the story. It has the main character, Mallory, partake in an opening diner fight scene and then drive away with a patron at the diner. That young man now rides in the car with Mallory listening to her stories. we then go into flashback mode and see the stories, and after each one of them, we come back to the car with the two of these characters driving around, and play catch up. Mallory then asks this guy, Scott, to recall some of the names and places she has been talking about. really, this is all helping us keep track of things. 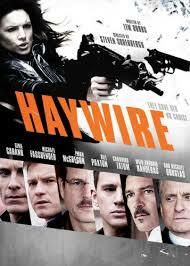 the most appealing thing about haywire is undoubtedly the action. While the plot might be similar to Bourne movies, it is the action that sets this movie apart from everything else. Soderbergh shoots it with a unique style, often staying far back and letting the action play out in full screen shots. Other movies like to bring the camera in on the action and give us quick cuts so that we can only see what they are showing us. Soderbergh wants us to see everything. And he always plays his action without any background music, so that you can hear every blow clearly and feel more like you are there, in the moment. This movie is definitely going for realism when it comes to action, which means that Mallory never does anything that she wouldn’t really be able to do. She jumps off walls and pops up into the air before throwing a punch at times, and it all looks fantastic. Nothing is too easy for her, and any character that she puts down, she makes sure stays down. This isn’t the kind of movie where a character runs through twenty bad guys at once and we end up saying, “okay, she hit him once, but isn’t he going to get up again?” instead, Mallory keeps coming back on her enemies, delving out blow after blow until she is certain there will be no retaliation. the plot, of course, is the been there before part of the movie. We have seen all of the Bourne movies and the other spy movies that came before it (Bond, Mission Impossible). this movie does not feel especially fresh, and even some of Soderbergh’s films feel similar. Like The Limey, which uses the same light’s getting cut in a house when the attacker arrives ending, (the limey was also written by the same screenwriter as this film). Still, the style of this movie outweighs the familiar plot. Soderbergh has crafter a very fun film here. Yes, we know that everyone Mallory is dealing with is bad, and we don’t trust anyone and aren’t really surprised when they turn out to be bad, but that’s all plot stuff. This movie is about action and style. in those areas, it succeeds. Gina Carano is not a great actress, and that’s very clear from the opening diner scene with her struggling with some of her lines. But she does have a menacing presence, which is just right for this role (she talks like Linda Fiorentino and moves like Tony Jaa). I like the way this movie jumps back and forth through time, continuously coming back to the car from where she’s telling the story so that we don’t forget that everything we are watching is in the past. I also appreciate all of the strategies Soderbergh employs to help make the movie more easy to follow. It’s a pretty cool and enjoyable film.